My dalliances with Electric shavers have never been very successful in the past which was mainly caused from sensitive skin around the neck area which has always seemed to contain the most pesky and stubborn stubble that always seem to evade shavers of the electric variety. The fact that an electric shave seems to take as long as a wet shave but equally leaves you feeling like you needed a wet shave all along, ensured I left them alone for 10 years, however the arrival of the Braun Series 5 5040s-5 Wet and Dry Electric Shaver for my latest Bzz Agent Campaign might just change that. Having tried the latest Braun model for 4 dry shaves, I am incredibly impressed and a great shave doesn’t take too long thanks to its wide head and a really close shaving mechanism. My only gripe with my early testing of the shaver is the location of the power button, as I have slipped a few times causing me to switch it off by accident but this could be about me getting to grips with the device rather than a design flaw. it was now time to test the much anticipated wet shave feature of the latest offering by Braun. As someone that has previously avoided the world of electric shaves, it seemed weird to take an electric device (albeit cordless) into a shower complete with shaving gel but no mirror, you couldn’t complete a normal wet shave this way so this concept felt alien to me. I gave it my best shot and despite not having a mirror, I enjoyed a much closer shave and my skin felt incredibly fresh and like I had just had an actual wet shave with a blade. There were a few awkward hairs missed on my lower neck area but this was probably because I didn’t use a mirror in the shower. My next test was with a good old fashioned sink and mirror, after adding shaving gel and the wet shave button, the only issue I encountered was when I needed to use the classic electric shave tactic of pulling my skin a little to make the hair stand up as this is quite difficult with a wet face covered in foam. However, I simply went back over the area afterwards and I was left with the best electric shave I have ever had with the added bonus of having no skin irritation whatsoever even if it was a little messy. After my testing it appears that there might finally be a rival to the more traditional wet shave and it comes in the form of Braun Series 5 5040s-5 Wet and Dry Electric Shaver. The price and lack of Clean & Charge Station are the only reason for me not giving this top marks. If you are thinking of purchasing this shaver and have any questions or concerns, send me a message and I will do my best to help and give you piece of mind before you take the plunge and make that expensive purchase. This is the first obstacle that I needed to overcome because Tesco for example sells 2.5 kg of Kent jacket potatoes for around £2.25 whereas the McCain frozen ones are £2.50 for four potatoes so they are expensive in the comparison. Upon opening the packaging the value for money point is further hammered home as the size of the McCain frozen potatoes is significantly smaller in comparison to what you would find in a traditional bag of spuds. However, we are living in an age of convenience and I must admit that the thought of waiting a few hours for a jacket potato to cook is enough to ensure that the only time I get to eat one is when I’m out and about, which means that I purchase from a man in a van. This is the big selling point of McCain’s product, because you can put one in your microwave for 5 minutes, which is just long enough to grate some cheese, open a can of tuna and tub of butter before tucking into a jacket potato with a tasty filling, making this the perfect comfort food. At this point, I finally understood exactly why these frozen tatties could be quite useful in our hectic modern lives. If you are sick to the bad teeth of eating the same sandwiches at work each day, it would also offer an alternative that can be simply thrown into a microwave. No scraping or washing the potato either, so if you are short of time then this really could be an option for you. After 5 minutes in the Microwave, my first opinion was of slight disappointment as the skin just wasn’t crispy, which is something that I love about a good old fashioned baked spud, so if this is something you prefer too, then I would recommend opting for the longer 45-55 minutes in the oven method. I find it quite hard to criticise the taste itself, because potatoes are not known for their killer taste sensation and we all add butter and fillings of our choice for this very reason. It’s worth pointing out to those of you on a health kick that these come in at around 205 calories on their own, so don’t go too crazy with the butter. The potato itself is incredibly white and fluffy and almost mash like which is not a problem for me but they do feel quite dry (before butter added). The good news is there is no hard potato to be found anywhere so that’s one pet hate of mine out of the way. 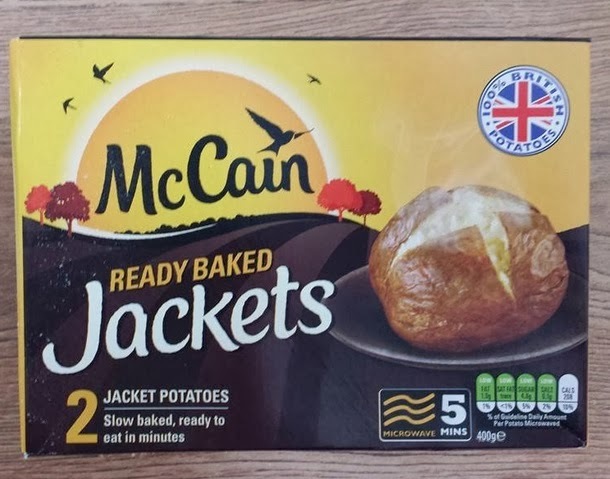 There’s nothing quite like the smell and taste of a slow oven-baked jacket potato, but the downside is waiting ages for them to cook, so ultimately, if you feel like a pleasant change from sandwiches at work or need a few emergency snacks in your freezer for when you find yourself short on time, then the McCain Ready Baked Jackets will be perfect for you. Sure if you want the crispy skin to your potato, then you are better waiting for around 45 minutes in the oven, but the biggest negative must be the price. Ultimately we all have a choice on our hands, do we pay £2.25 for a whole bag of potatoes that take several hours to cook, or pay around the same price for a couple of frozen potatoes that take only 5 minutes in the microwave? That’s the trade off on offer here, so for me personally, as an occasional emergency snack, they are perfect but I wouldn’t expect these to appear on anyone’s weekly shopping list. 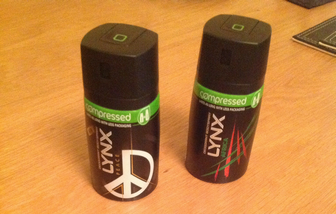 I recently had the opportunity to try one of the new compressed deodorants for free as a BzzAgent and must admit to being a little sceptical that these much smaller cans of Lynx with 50% less gas actually have the same amount of body spray as the full size cans. Compressed deodorants deliver the same protection, but due to an innovative new spray system they require less gas in each spray. With less gas needed, the can is smaller but still contains the same amount of deodorant. That means it will last just as long as your normal can, even in the smaller size. From an environmental point of view the fact they are using 50% less gas and 25% less aluminium is a fine example how a small change can make a big difference whilst also adding convenience to the customer. If 1 million people switched to Compressed deodorants, every year we could save: (Figures based on people using an average of 5 cans in a year) 696 tonnes of CO2 Equal to the average emissions of a car travelling 126 times around the earth Enough aluminium to make 20,000 bikes say Unilever, which shows how small changes can make a big difference. From a personal point of view, this new smaller size makes it a sensible choice for your trips away, gym bag or even a drawer at work for when you feel the need to freshen up. When you combined this information with the fact that they last as long as the original bigger cans, it makes the option of choosing a compressed can the natural choice for any forward thinking individual. The nice people at BzzAgent sent me the new Foreo LUNA Mini and I will be the first person to admit not knowing anything about this little device and I’m not the kind of guy that has a “routine” so this should be of no surprise. For the last few years, the standard gift for ladies at Christmas has been a set of expensive GHD’s but now everyone has a pair, step forward a new essential device for £99 which is sure to be a big hit this Christmas. It’s way more effective than washing by hand, providing visible results in just three days! It is described as ‘extremely hygienic’ due to being made of silicone, non porous and is fully waterproof so can be thoroughly washed after every use without damaging the electric charging port. It also delivers up to 300 uses with just one charge! The video below shows you the product in use and shows that it is also unisex but they do offer a separate version for just men too. The best way of describing this to anyone that hasn’t heard about the LUNA Mini, is imagine an electric toothbrush for your face! Sounds crazy right? Even after using a Luna Mini for a short time, you notice an improvement in your skin. It looks and feels smoother and I was not expecting to see results so quickly but even this old cynic must admit, it really does work. This small device has 300 uses in one charge, so will slip into anyone’s travel bag without worrying about carrying yet another charger to accompany your phone, tablet or laptop. An electronic cleansing device that both men and women can use is sure to be a big hit at Christmas for anyone that wants cleaner, fresher and smoother skin. The only downside of this product is the price, and £99 is a hefty price tag but as my wife tells me “If you look after your skin, it looks after you.” The best compliment I can give the LUNA Mini is my wife has since taken it and uses it twice a day and cannot speak highly enough of how much better her skin feels. So if you get around the price tag, it could quickly become an essential part of your daily routine.